The key international jewellery event – the September Hong Kong Jewellery & Gem Fair (September Fair) (http://exhibitions.jewellerynetasia.com/9jg/) – opens today at AsiaWorld-Expo (AWE). AWE houses the raw materials section of the September Fair. The fine finished jewellery section, meanwhile, will open on 18 September at the Hong Kong Convention & Exhibition Centre (HKCEC). Celebrating its 33rd edition, the September Fair once again breaks its record by featuring 3,752 exhibitors from 50 countries and regions. Fair organiser UBM Asia expects about 60,000 buyers from around the world to create active traffic in the two venues’ exhibition space totalling over 135,000 square metres. - Launch of brand new Bridal Jewellery Pavilion in response to the solid demand of global bridal jewellery market. Featuring exhibitors from mainland China, Germany, Japan, Taiwan and the United States, buyers can source one-of-a-kind bridal masterpieces and the classics, which are sure to cater to every bride’s and groom’s needs. The pavilion is located in Hall 3E Concourse of HKCEC. - South Africa Pavilion debuts and brings the number of group pavilions in two venues to 23. The rest of the pavilions represent groups from Antwerp, Brazil, China, Colombia, France, Germany, Hong Kong, India, Indonesia, Israel, Italy, Japan, Korea, Poland, Singapore, Spain, Sri Lanka, Taiwan, Thailand, Turkey, the United States, and the International Colored Gemstone Association (ICA). 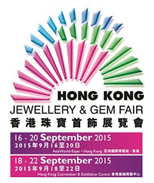 - The Fair features the single largest showcase of Hong Kong jewellery. This year, there are 1,340 Hong Kong companies participating in the two venues, accounting for around 35 percent of the Fair exhibitors. - The Designer Arena is 26% bigger in terms of exhibition space this year. Fifty-one jewellery designers will unveil their creations during the Fair. - The Fair is yet again home to the world’s largest Diamond Pavilion, with 455 diamond companies, and Asia’s biggest gemstone marketplace, with 762 gemstone companies participating. - New exhibitors from Latvia, Myanmar and Qatar are participating. - ALROSA, Russia’s leading diamond company and the world’s biggest diamond miner by volume, hosts its diamond auction at the Fair from 16 to 20 September at AWE. Despite challenging economic conditions in some parts of the world, overall demand for jewellery continues to grow, thanks to the rising number of middle-class consumers in emerging markets. Mainland China is one of the main drivers of this growth; its retail sales of gold, silver and jewellery totalled RMB154.7 billion (US$25 billion) in the first-half of 2015, up 5.2 percent from the same period last year, data from the National Bureau of Statistics show. “The spending power of the young generation could mean billions of dollars of potential new jewellery consumption in China,” said Celine Lau, Director of Jewellery Fairs, UBM Asia. “The continuous growth in per capita income bodes well for the country’s jewellery consumption. We have observed that the buying habits of young Chinese consumers have changed. They no longer pursue jewellery solely for investment purposes; rather, they buy jewellery as part of their wardrobe so they look for collections that are trendy and suitable for daily use. Thus, a new concept – Light Luxury – would be the main focus in coming years,” Ms Lau continued. Over the past several years, the September Fair has served as a bridge to tap into China’s lucrative market. As the preeminent jewellery fair for the industry, the Fair provides the greatest product range for buyers not only in China but worldwide. “The Fair is not only an effective marketplace and platform to tap into the Asian markets, but also functions as a “filter” as only serious buyers and exhibitors will attend world-class fairs like the September Fair. A fair of this calibre offers tremendous value to both exhibitors and buyers. It also provides easy access to some of the industry’s most reputable vendors, thus helping the industry to continue to grow,” Ms Lau added. To bring in more buyers from robust markets, UBM Asia has significantly enhanced visitor promotion. As a result, 21 buyer delegations from the mainland China are invited. Overseas delegates from Israel, Italy, Russian Federation, Sri Lanka and Vietnam will visit the Fair, thus boosting potential business opportunities. The Hong Kong Premier Pavilion features around 40 of the city’s outstanding jewellery companies and their brands. Visitors are sure to be captivated by the exquisitely crafted jewellery collections that reflect the very best of Hong Kong’s jewellery manufacturing traditions. The pavilion is located in Halls 1D & E of HKCEC. The International Premier Pavilion is a destination for the trendy. Located in Halls 3B & C of HKCEC, the pavilion houses a select group of around 70 exhibitors from 20 countries and regions, namely Austria, Belgium, Brazil, mainland China, France, Germany, Greece, India, Israel, Italy, Japan, Korea, Philippines, Russian Federation, Spain, Switzerland, Thailand, UK, United Arab Emirates, and the United States. The Fine Design Pavilion hosts 74 internationally renowned jewellers in the Grand Hall of HKCEC, where exquisite jewellery set with luxurious and rare diamonds, gemstones and pearls, as well as top-quality bejewelled watches, invaluable masterpieces, and exclusive one-offs from around the world are showcased. The Fine Gem Pavilion is dedicated to the world’s finest loose diamonds, pearls and gemstones. Located in Hall 9 of AWE, a total of 54 esteemed exhibitors will showcase a variety of loose gems of the highest quality. The Fair press conference will be held on 18 September from 11:00am to 12:30pm in meeting rooms S226 – S227 of HKCEC. Heads of jewellery associations will share their views on the developments in the jewellery trade. The Senior Vice President of UBM Asia will announce the latest developments in UBM Asia’s jewellery fairs portfolio. 1) AWE Welcome Reception – Organised by UBM Asia and sponsored by the Israel Diamond Institute (IDI), the Fair Reception will be held on 16 September at the Hong Kong SkyCity Marriott Hotel. 2) HKCEC Welcome Reception – Organised by UBM Asia, the Fair Reception will be held on 18 September at the Grand Foyer of HKCEC. For more details of special events, please visit http://exhibitions.jewellerynetasia.com/9jg/specialevents. The September Hong Kong Jewellery & Gem Fair is held concurrently with the Asia’s Fashion Jewellery & Accessories Fair (AFJ) at AsiaWorld-Expo. Buyers attending the September Fair can enjoy free access to AFJ. For the convenience of registered exhibitors and visitors, the Organiser has arranged a free continuous shuttle bus service running directly between HKCEC / TsimShaTsui / Tung Chung and AWE. For pick-up points, bus schedules and more information about the Fair, please visit http://exhibitions.jewellerynetasia.com/transportation/9jg. The Fair is open to jewellery trade professionals and members of the press. Free admission will be granted to visitors who present their business cards or official invitation together with Hong Kong Identity Card/ Exit-entry Permit for Travelling to and from Hong Kong and Macau/ National passport. Visitors under 18 will not be admitted. To strengthen the security measures, all attendees shall present a valid photo identity document for on-site identity verification whenever entering the halls. We need your full support to maintain a business-friendly environment in the fair. Your cooperation is highly appreciated.